Todays post will be about Metropolis Nevada, which is a ghost town 24 miles to the north of Wells, Nevada. 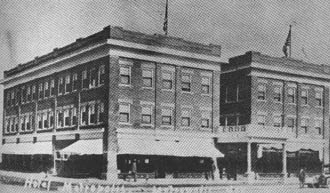 History: Metropolis has a colorful history as an agricultural experiment. It began as a joint venture in 1909 between the Pacific Reclamation Company and the Metropolis Improvement Company. To lure Utahns to resettle in Metropolis the companies started a promotional campaign claiming fertile land. It was fraudulant because the area was in the Starr Valley of Utah not Nevada. Before the Mormon church could encourage people to resettle in the new town a dam on Bishop creek had to be built. This new dam would irrigate crops and provide water for the town. Builders used 6.5 million bricks from the 1906 San Fransisco earthquake. Wet years in 1911 and 1912 also facilitated resettlement. 1912 was the boom year for Metropolis. In town a beautiful hotel and school were built (photos below). A newspaper called the Metropolis Chronicle started publication and a daily railroad service transported people to and from Wells. The boom did not last long for three reasons. First, Lovelock farmers filed suit about water rights on Bishop Creek. As a result, the resovoir could not fill drastically decreasing the amount of acres that could be irrigated. In 1914 the wet years ended which led to a cricket and jackrabbit infestation devastating crops. Finally, in 1916 a Typhoid epidemic swept through town killing many residents. 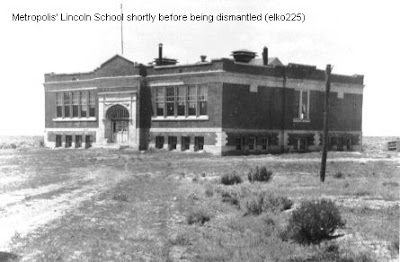 Overtime, remaining residents left and the iconic school and hotel succumbed to fire and vandalism (information from: Old Heart of Nevada Ghost towns and mining camps of Elko County By: Shawn Hall).